India plans to invest $1bn (£528m) into develop oil and mining projects in Africa's Ivory Coast over the next five years, an Indian ambassador said. The country hopes to tap into the region's vast oil wealth by accessing the Gulf of Guinea's shoreline. To boost trade ties, India is looking to open new factories in the region, said ambassador Amarendra Khatua. India has increasingly been looking at ways to find more raw materials and energy to feed its expanding economy. "India and China - because of their population demands, economic growth and increasing prosperity - need energy security, plus they have money to invest now," said Mr Khatua, India's ambassador to Ivory Coast. However, India's desire to invest comes as Ivory Coast remains unstable following a civil war that ended in 2003. "India has identified this market and it believes this crisis will be resolved soon and that it will then be able to penetrate deeper into the market," said Mr Khatua. Oil production in Ivory Coast stands at more than 60,000 barrels per day. 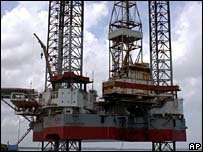 India's Oil and Natural Gas Commission has already invested $12m to explore an offshore block in the region, that it is now drilling.